Where are all the wine stories? German rehabilitation hospitals are pretty nice. My room had a view into the Black Forest, and there was a bar on the next floor. So when I opened my work email and found myself faced by hundreds of wine pitches, I had the choice of recovering by going for a walk or having a stiff drink. Have a guess which one I chose. I hadn’t looked at my email in a long time – I’d been been too busy reading to think about work. Reading is how I got through nearly an entire year of medical treatment, where my choices were either die of cancer, or die of boredom. Hospital was dire: the food was awful, there was no wine, and the walls were white. Given that I didn’t have enough German to chat to anyone, the overall effect was like being in a sensory deprivation chamber. The only thing that broke the monotony was the occasional death, which, while definitely exciting, made us patients huddle fearfully in our beds, wondering if the Scything One was coming for us next. Fortunately, there was Amazon. Once a week I’d order a stack of books and each morning I’d take a fresh one off the pile and dive in. As I submerged myself in the text, the white walls and the woman snoring in the next bed gradually disappeared. You name it, I read it: chick lit, Booker prize winners, classics and the occasional murder mystery. But I also read narrative non-fiction, and every long-form article I could get my hands on. I subscribed to the New Yorker, Vanity Fair, The Atlantic Monthly, Wired, and more. Fortunately for sick people everywhere, we live in a Golden Age of non-fiction writing, thanks to a convergence of forces, not least of which is the proliferation of professional writing degrees; the overall result has been an outpouring of great writing. My Year of Reading got me so re-energised about writing, that weeks before I was due back at work, I fired up my email and started going through story pitches. The first thing that struck me was that I’d seen all these pitches before. The same handful of story ideas were repeated across dozens of emails. It’s as though we’re all caught in a loop – wine writers see these stories appearing in the wine press, and so assume that’s what editors want. We assume that’s what we should publish, because it’s what’s always been published in the wine press. And the cycle continues. That’s when I had my second realisation. Despite spending an entire year immersed in the best non-fiction produced in the English-speaking world, I hadn’t seen a single article about wine. To be clear, I’m talking specifically about narrative non-fiction. These types of articles, which use storytelling techniques to bring the subject to life, stand at the pinnacle of contemporary writing, and it’s where wine is missing in action. Which is the weirdest thing, because if there’s one thing the wine world loves to talk about, it’s the need to tell wine stories. We’ve all been at those gatherings where some moist-eyed, sentimental person will exhort everyone to ‘start telling our stories!’ And everyone applauds and agrees that, yes, we need to start telling wine stories. And yet wine remains corralled inside wine and lifestyle columns, going round and round the same topics. Unlike other types of consumer journalism – food, fashion, motoring – it rarely leaps the barrier into the prestige features sections, where deeply reported, exciting storytelling can be found. I’ve given it a lot of consideration in the last couple of years, and here are some thoughts I’ve had. Most wine writers starting writing about wine because they’re besotted with it. They want to spend their days tasting it, finding out where it came from, and talking to the people who make it, rather than pursuing other types of stories. Basically, they’re not really interested in telling big stories. Or else they’re obliged to knuckle down and taste continuously, to keep their column fed, so they don’t have room for anything else. Wine writers also spend years building their relationships and are reluctant to jeopardise them. For although the industry says it wants its stories told, in practice it’s remarkably risk averse. On a number of occasions, people have told me relatively innocuous anecdotes, only to warn me straight away that I can’t use it, because ‘it doesn’t send the message we want’. Third, it takes time and funding to write truly great stories, and most wine writers don’t have enough of either. That’s why the big narrative non-fiction wine books tend to come from the USA, where the advances are bigger and there are research grants available. But I also think the skills that make someone a great wine writer often work against great storytelling. In traditional wine writing, the writer is front and centre. They have snaffled the gig primarily because of their expertise. The wine writer is typically the ultimate insider, whose job it is to explain how wine works. In great storytelling, it’s the story that sits front and centre. If the writer appears, it’s often to play the faux–naïf, or the innocent abroad – the outsider who enters this new world to discover how it ticks. If the narrator is already an established expert, there can be no journey of discovery. Stories need protagonists. There must be at least one person to whom things happen, whether that’s the narrator or someone else. Finally, there must be something at stake. Obstacles are the fuel that drive stories. This is where wine writing suffers, because often there’s nothing at stake. The featured winemaker is typically the proud owner of an excellent piece of terroir that allows him or her to create excellent wines. If there were any difficulties along the path to success, they’re all safely in the past. The trajectory is ever upwards, into the sunlight. Yet as Italian writer Umberto Eco said recently, winners aren’t interesting – it’s struggle that drives the most emotionally compelling stories. When I talk to writers about this, they often think I’m telling them to start tabloid-style dirt digging. But there are plenty of high-stake stories that don’t turn on wrongdoing. ‘Man against nature’ – an ideal theme for an agricultural product – is a classic literary trope that can make for a thrilling story. Think The Perfect Storm. Other people tell me the general public just aren’t interested in reading about wine. That’s not true. Elin McCoy’s Emperor of Wine (2006) sold extremely well, as did George Taber’s The Judgement of Paris. (2006). Frances Dinkelspiel’s new book, Tangled Vines, is a bestseller, while Benjamin Wallace’s New York article on Rudy Kurniawan went viral, and I’ll bet he got a book contract out of it. People love great stories. I know the professional wine writers who’ve read this far are guffawing. The first thing they’ll say is they’ve tried pitching interesting stories to editors, with no luck. To be honest, this often comes back to what wine people consider a great story – usually not a tale of intrigue, personality and high stakes, but rather an offer to write a piece about an obscure grape. Or if the story is genuinely heart-pounding, it’s better off going to a general features editor, rather than a wine publication. Or they’ll tell me that commissioning editors always ask non-wine writers to write the good stories. The example that’s used is the New Yorker commissioning a non-wine writer to do a profile piece on Robert Parker. But did any wine writer pitch this story to the New Yorker? Is anybody actively offering them stories of drama, folly and glory? And before the guffawing gets raucous at the hubris of me encouraging people to go round pitching stories to the lofty New Yorker or similar outlet – why not? Why is that weirder than setting out to do an MW? It’s less expensive, for a start. Still, there’s no point analysing all this without offering a solution as well. I have two. My second is an offer. If you’ve stumbled across a story – great stories don’t have to be investigative, by the way; they can be small and heartwarming – and you’ve got the skill to tell it, drop me a line. I edit a bi-monthly trade magazine with a specific audience profile and limited space, so mostly I’ll say ‘no’. It’s not personal. But if you believe the story is a good fit, contact me anyway. I hope somebody takes me up on the offer. It worries me that there are some types of lived experience that are falling out of wine history, because they’re not being written about. Also, I truly believe telling great stories is important, life-affirming work. After one particular round of chemotherapy, I got sepsis. Blood poisoning shuts down the organs, while your temperature soars so high, you start fitting. Medical personnel sprint to get to you before death does. I remember looking at all the faces round my bed and realizing, with horror, why they were there. My next thought? I can’t go yet! I haven’t finished my book! Writers need to tell stories like a life depends on it. Because sometimes, it really does. This article came out of a speech I gave at the Digital Wine Communicators Conference in Plovdiv, Bulgaria in October 2015. It then appeared on timatkin.com and was then translated into Danish and published by Vinbladet, Denmark’s major wine magazine. Please note I was sick a few years ago, and I am fully recovered. 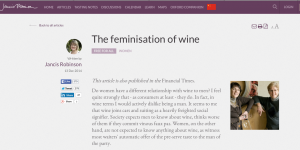 A piece that Jancis Robinson MW wrote on a topic dear to my heart! And since she quotes me, it gets filed under ‘shameless self promotion’.